Parts of Greater Manchester have been rocked by an earthquake. The tremor at 1150 BST on Friday affected Manchester centre, Reddish, Didsbury, Failsworth and Denton. Seismologists at the British Geological Survey (BGS), Edinburgh say it was 2.5 on the Richter Scale, but there are no reports of any injuries or damage. 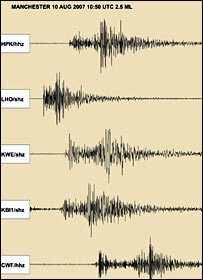 The BGS say these tremors are not uncommon and there are eight or nine a year in Britain. Manchester was hit by a series of tremors five years ago. A tremor which hit Manchester in late 2002, which measured 3.9 on the Richter Scale, was 130 times greater than Friday's. And a BGS spokesman said the earthquake which caused the Asian Tsunami on Boxing Day in 2004 was 800 million times greater. But the earthquake on Friday was still felt across Manchester. One worker in the city centre said: "The ground kind of shook. "It felt a bit like there was a bus parked outside but a bit stronger. "Everyone just looked round at each other and was like, 'Did you just feel that or was it just me?' I didn't really feel frightened just a bit confused." Another witness said: "I was working away quite happily until I felt the building shake. I felt the floor move and heard the beams creak. "It started at one end of the room and went came through to where I was sitting and the big filing cabinet next to where I was sitting was shaking. It was really quite impressive." Ernest Rutter, professor of structural geology at the University of Manchester said: "It's very small tremor, right on the edge of being felt, although obviously quite a lot of people did. "They are fairly common in Manchester. In 2002 we had a swarm of them, which is a number of earthquakes of about the same size over a period of time - from October and extended until just after Christmas. "There were about 110 - 120 during that time and about 30 of them were felt." But he added: "You can't tell if a little earthquake is going to turn into a bigger earthquake and you can't tell how frequently they are going to occur." The BGS spokesman said he did not expect any structural damage as a result of the quake. He said: "As earthquakes go it is quite insignificant."